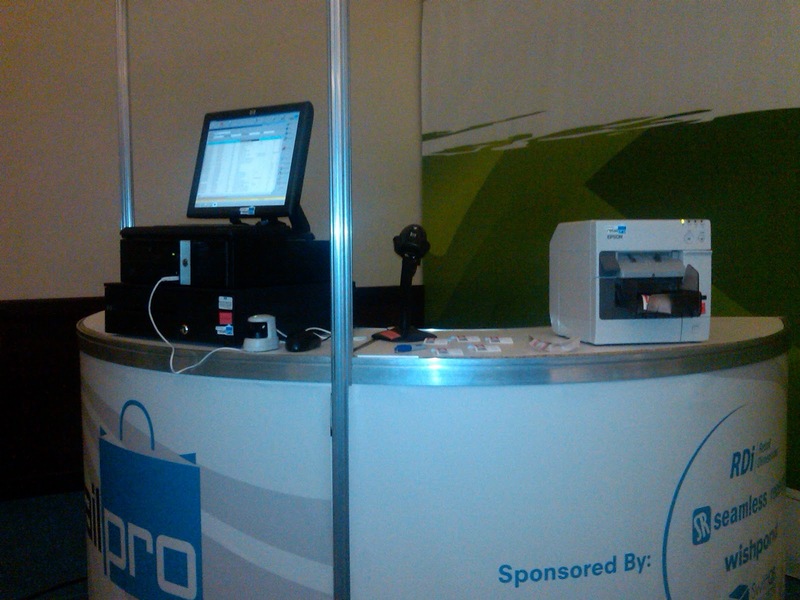 Recently, I demonstrated the TM-C3400 ColorWorks printer at the Retail Pro® Reseller and Customers conference. If you don’t know, Retail Pro® (http://www.retailpro.com) was developed in the mid 1980s and is now a leading international point of sale software provider. This company specializes in delivering cost-effective, scalable retail software to small and mid-tier retailers who wish to grow their businesses. Retail Pro’s solutions manage billions of transactions annually in more than 45,000 store locations worldwide, in 75 countries, and 18 different languages. 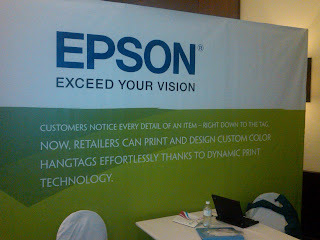 During the demonstration, we showed hang tags designed using the Document Designer included in Retail Pro v9. Using this designer, users can customize existing or create entirely new tags and labels that pulls data directly from the item database, including images, logos, product descriptions, UPC codes, prices; anything that is stored about the item. During the event, I met several very good Retail Pro resellers, including Gary Waters of Retail Tech Centers (http://www.rtechcenters.com/). 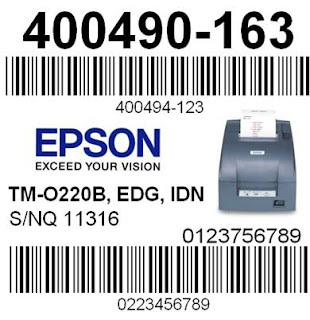 RTech is the first partner to begin using and selling the capability of on-demand color tags and labels produced by Retail Pro and the Epson TM-C3400. RTech is one of the Southeast United States’ leading providers of advanced technology to retailers and hospitality providers. 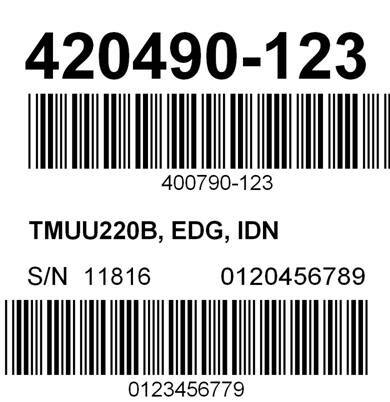 According to Gary, “With the TM-C3400, retailers can produce color barcode price tags of varying lengths without changing stock. This capability eliminates wasted time and tag stock as the operator does not have to stop, load different stock and reset the printer to tag different types of inventory. Using the Retail Pro Document Designer tool, retailers can establish pre-define tag designs in the Retail Pro inventory item record. This tag inventory makes for seamless on-demand custom color tag printing. Loss prevention is also enhanced using on-demand color tags. With Retail Pro, retailers can add an image of the item on the tag to prevent tag switching. With improved associate productivity, increased loss prevention and increased sales revenue with the marketing potential of on-demand color tags, the ROI on the TM-C3400 is very good." If you are a value added reseller, you may want to contact Retail Pro to discuss producing color labels and tags on demand using the TM-C3400. If you are a software vendor, consider how promoting the capability to produce color tags and labels will increase customer satisfaction and your business. If you would like more information, feel free to contact me anytime. A family-owned company committed to the highest quality products and to their customers’ well-being, OPI Products, Inc. is a world leader in professional nail care and the Professional Beauty Industry. Probably more than any other professional nail care product it produces, OPI is renowned globally for its Nail Lacquers – a brilliant, chip-resistant, professional formula available in over 200 fashion-forward colors. With clever names that customers look forward to with each new Collection, OPI Nail Lacquers are beloved around the world, and trusted by professionals. This year, OPI decided to improve the visitor management processes, both in their offices and distribution center. Prior to implementing a new solution, OPI employees were required to fill out forms for each visitor; and to make a copy of the license of the driver of each vehicle entering their distribution center. With the recommendation of the value added reseller, Laminex, (www.laminex.com), OPI Products selected the visitor management application, Lobby Track from Jolly Technology (http://www.jollytech.com/visitor-management.php) and the TM-C3400 ColorWorks label and tag printer. Laminex is a leading provider of Photo ID, Access Control, Time & Attendance, and Visitor Management Systems specially designed to meet an organization’s needs. Now at the distribution center, OPI developed a self-service kiosk, where drivers are required to scan their license and fingerprint. Once scanned, OPI prints a label with the driver’s name, expanded picture, fingerprint and image of the license. This label is then attached to the shipping documents as proof-of- picked up of the order. For drivers who have made previous pickups, they just need to scan their license to receive a newly printed label. In their facilities, OPI is using the standard Lobby Track application printing visitor badges. 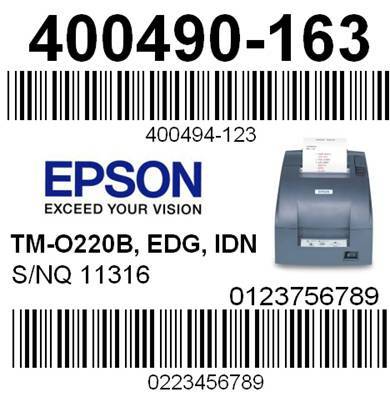 Based on the recommendations of Epson partners, OPI Products have developed a unique, new solution using the TM-C3400 printer; that saves them time and money. Contact me to learn more about this or other solutions; or tell me about the solutions you have developed and implemented using the TM-C3400. Located in Claremore, Oklahoma, Upco Inc. has the second largest factory in the world for the production of sucker rods. With a total capacity to produce over thirty million feet of sucker rods per year, Upco is the only domestic supplier of sucker rods owned by employees. For those who don’t know, sucker rods join together the surface and downhole components of a reciprocating piston pump installed in an oil well. To improve the efficiency of the plant, Upco required a system to identify quickly and easily the grade of steel scrap in their plant. Having 7 or more different grades, employees were required to read black only labels which could create confusion and potential errors. 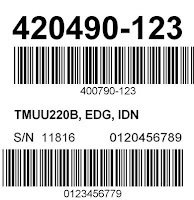 To reduce the potent for errors, Barcodes, Inc. (http://www.barcodesinc.com/) of Chicago, IL recommended Upco purchase a TM-C3400 on-demand, color label printer as well as recommended media for their application. To complete the solution, the Information Technology group in Upco wrote an application in Visual Basic to automatically select the correct color based on the grade of scrap and to print the label on the TM-C3400. By adding a band of color, employees can easily identify the grade of scrap, saving time, reducing errors and saving money. Upco created this simple, yet elegant color-based solution that works well for them. And by recommending the TM-C3400 on-demand color label printer and getting me involved, Barcodes, Inc. has another satisfied customer. Talk to your customers about how adding color can improve their manufacturing processes. 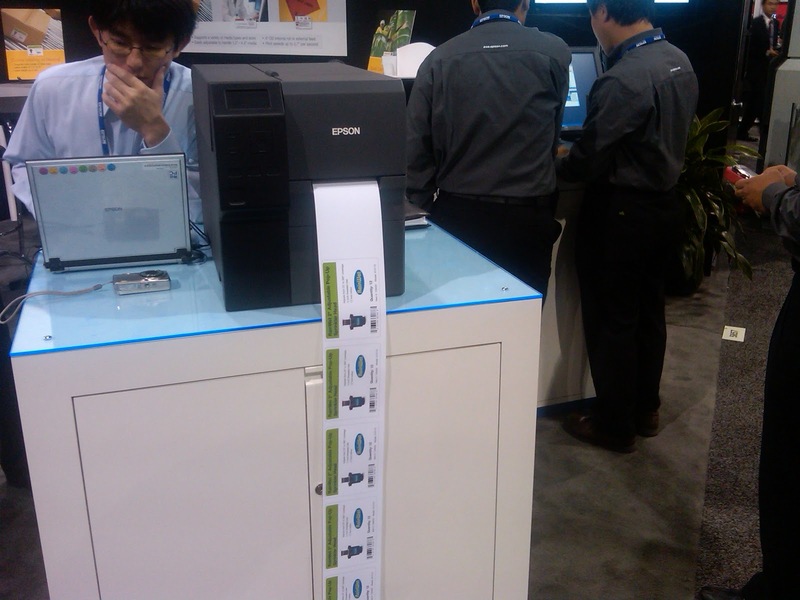 At Pack Expo this past week, Epson demonstrated a new, benchtop, on-demand color label printer scheduled for release late spring 2012. Currently code-named Shiraito, this new printer produces color labels at 10 to 12 inches per second, uses 4, large, color cartridges and includes a built-in cutter. This new printer produced beautiful color labels; very quickly. In addition to Epson, I understand another company, with a print engine, has OEM customers who will release fast, on-demand color label printers. Imagine; soon you will be able to print labels with color pictures, graphics or logos as fast as current high-end black-only thermal transfer label printers. With the availability of these new on-demand color label printers, I wondered; how will this new technology impact the $2 billion global barcode printer market? Or the $55 billion global label business? At this point in time, some people believe that color will have little to no impact in the world markets; until the cost per label becomes cheaper than black only/monochrome. I hear the statement all the time; “I'll consider color when the cost per label is less expensive than thermal transfer.” Cost seems to be the only decision-making criteria for some people. I have a different perspective; on-demand color will make a big change in both the label and barcode printer markets for five reasons. First, color has made a significant impact in other peripheral device markets. In the related page-printer market, color accounted for 44% of the printers sold globally in 2006 (http://www.gartner.com/press_releases/asset_145732_11.html). In another related market, copiers, color accounted for approximately 20% of the units (and probably much more of the revenue) of the global copier market in 2008 (Garner Dataquest). If these two markets can move to a significant degree to color, I see no reason not to expect the same results in the barcode label printer market. Second, adding color to existing labels will increase the readability of labels. Labels are the one document most customers and supply chain members must read/scan. “Nobody reads black print anymore” was a statement I heard just the other day concerning labels. If your customer wants to insure key information is communicated on a label, you should consider adding color pictures, icons, logos, and fonts. These devices insure critical information is communicated. In addition, the look of a label is significantly improved by the addition of color. 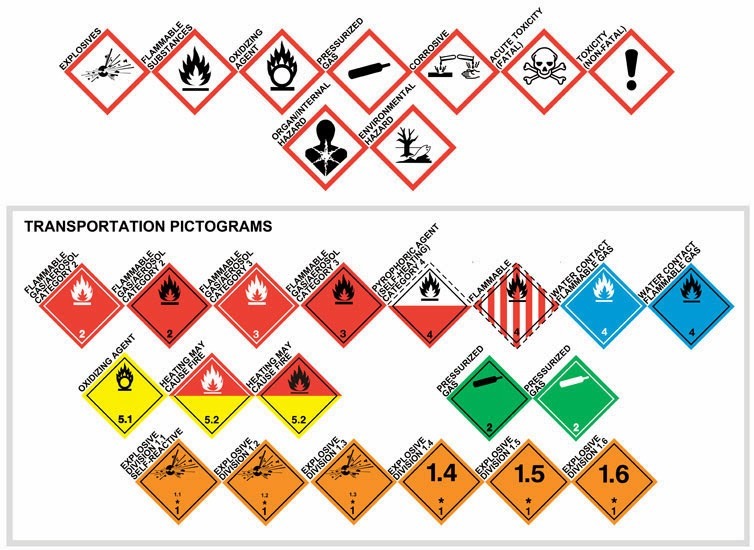 Ask yourself: which are these labels look better? Third, innovative customers and value added resellers are creating new solutions to help their work processes. These new processes will make companies more productive and position them more professionally. Keep up with my blog to learn about new applications and solutions using on-demand color label printers. Fourth, on-demand color labels will enable companies to establish new business models. For example, Catalina Marketing, an Epson partner, produced $500 million in revenue (http://www.catalinamarketing.com/pdf/Smart%20Business%20Magazine.pdf) in 2008 by publishing on-demand color coupons at checkout in grocery stores. Imagine the impact to the barcode printer market if just one of the shipping companies (FedEx, UPS, etc.) started using color label printers to publish or enable on-demand advertising on the packages they ship. Or if a major online retailer such as Amazon, Wal-Mart, etc. started adding or enabling special offers to the packages they ship. Shortly, an organization will find the means to monetize publish on-demand labels. Fifth, printers will convert short-run label production to the on-demand label printers. Many small manufacturers need a small number of labels for a high number of SKU’s; especially considering SKU proliferation and globalization of products. Today, many of these short-run labels are produced using a digital press which requires extensive setup time. In the near future, service bureaus will be able to fulfill these short-run orders much less expensively and faster than a digital press using high speed, on-demand, 4 color label printers. Therefore, a portion of the $55 global label business will move to the barcode label printer market. Bottom line: on-demand, benchtop, color label printers will make a very positive impact on the business of value added resellers and independent software vendors like you. Now is the time for you to become an “expert” in this market. Be sure to sign up on my blog; and let me know your thoughts on this market opportunity.